Seasonal food is important for extra freshness, value and flavour, find out ‘what’s in season’ this month and how to make the most of seasonal flavours from our Farm shop. 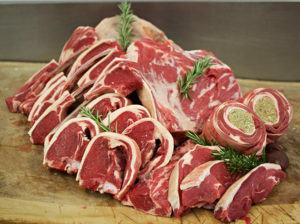 lamb is a sheep that is under one year old, and is known for its delicate flavour and tender flesh, it has a stonger flavour and slightly less tender flesh; anything over 2 years is called mutton, which has much more flavour, but also a tougher flesh that needs slow-cooking to tenderise it. All our lambs are home-grown and grass-fed all year, we have many different cuts of lamb available, which you purchase depends on how you wish to cook it, for roasts, the best cuts include leg, breast and neck (also known as rack of lamb), shoulder, saddle, rump and loin. 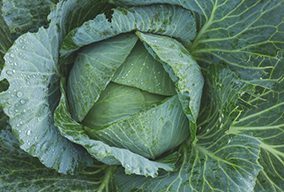 The cabbage, or brassica, family is huge, and includes everything from the familiar red, white or green varieties with tightly packed leaves, to cauliflower, broccoli, Brussels sprouts as well as pak choi, popular in Asian cookery. This round, leafed Savoy cabbage and the pale, lozenge-shaped Chinese leaf are considered to be two of the best to cook with. The flavour of cabbage varies from type to type, ranging from savoury to gently sweet, but one thing they all have in common is a rank smell if overcooked, so brief blanching is best! Used in almost every cuisine across the world, spinach is an enormously popular green vegetable. The leaves can be either flat or slightly ruffled, and are a bright green when young, deepening to a more intense colour when older. The bitter flavour is distinctive, you either love it or hate it, and particularly complements dairy products and eggs. 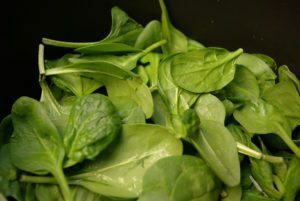 The younger leaves can be eaten raw in a salads, while the older ones are usually cooked (spinach has one of the shortest cooking times of all vegetables). It reduces very dramatically during cooking; a 450g bag will be just enough for two people. Great cooked in omelettes or added to one pot dishes or cooked with chicken and fish! Also known as green onions, spring onions are in fact very young onions, harvested before the bulb has had a chance to swell. Both the long, slender green tops and the small white bulb are edible, and are good either raw or cooked. 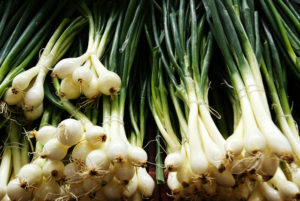 They have a similar flavour to onions, but are much milder in taste, great for adding to salads and stir-frys. 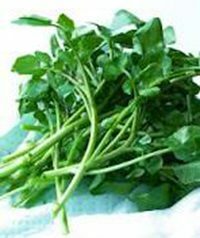 Watercress has deep green leaves, and crisp, paler stems, watercress is related to mustard and is one of the strongest-tasting salad leaves available. 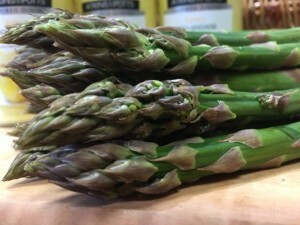 It has a pungent, slightly bitter, peppery flavour and is highly nutritious, containing significant amounts of iron, calcium, vitamins A, C and E. It’s sold in either bunches or bags, and is good combined in a salad with milder leaves, or made into soups, also great in salads and pairs well with cheese! New potatoes are in season April to July have thin, wispy skins and a crisp, waxy texture, these are young potatoes and unlike their fully grown counterparts, they keep their shape more once cooked and cut. They are sweeter because their sugar has not yet converted into starch, and are therefore particularly suited to salads. 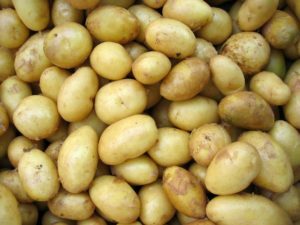 Jersey Royals are the best known variety, and their appearance in late April heralds the beginning of the summer, varieties include Pentland Javelin and salad potatoes, which are best eaten cold to appriciate their full flavour. A member of the cabbage family, with a structure that looks like a short celery, short white stalks with green leaves, the texture is crisp, and the flavour is somewhere between mild cabbage and spinach. If very young it can be eaten raw in salads, but is best when briefly cooked for a few minutes in dishes such as stir-fry or steamed with chicken or fish!